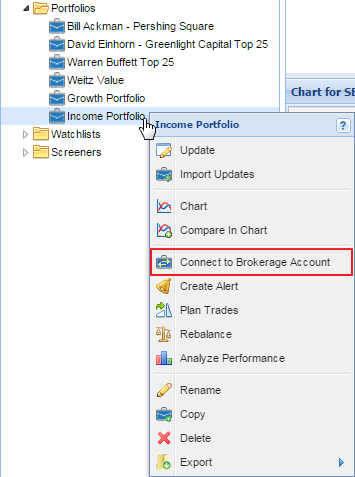 To connect your Stock Rover account to your brokerage account(s), right-click any portfolio or portfolio folder and select ‘Connect to Brokerage Account.’ This action can also be found in the Start menu. Both methods are shown below. 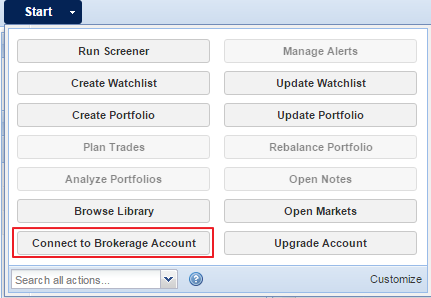 Note that brokerage integration is not available in the mobile interface; you must be logged on to the desktop UI to access the following actions. 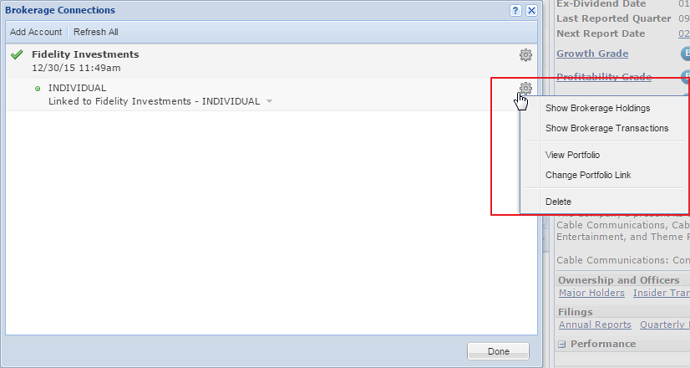 Above: selection from the Navigation menu above. Below: selection from the Start menu. You will be presented with a window that explains the process of brokerage connection. Uncheck the ‘Show This Window Again’ box if you do not wish to see this information again. Next, you’ll be shown the Term of Service. 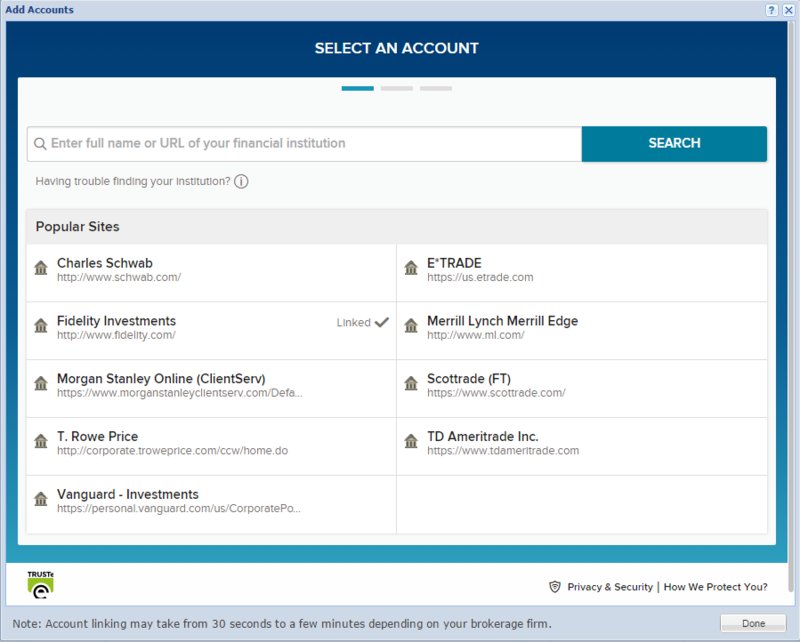 After accepting the terms of service, you’ll be connected to the Yodlee interface (shown below), where you’ll be able to search for your brokerage account. Note that some of the most common brokerage houses do not always appear at the top of the search results. Find your brokerage in the list of ‘Popular Sites’ (shown in the screenshot above) or consult our list of search terms to find the precise search terms for the most common brokerage houses. This panel is where you manage your brokerage connections. 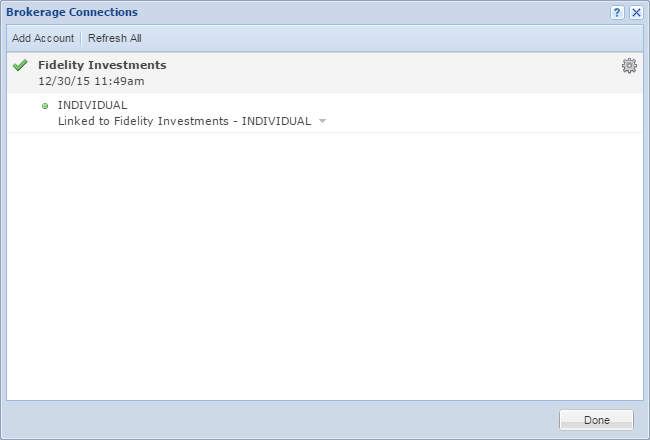 You can access it anytime by clicking ‘Connect to Brokerage Account’ in the Start menu or by right-clicking a portfolio and clicking ‘Connect to Brokerage Account’ or ‘Manage Brokerage Connection.’ Both of these methods are shown in screenshots above.